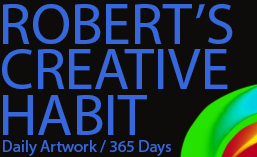 I figure before my Year of Creative Habits is behind me (which happens in less than two weeks! ), I should do what I said I would do a little while back; start trying to draw some people! This is my youngest niece, Emily. 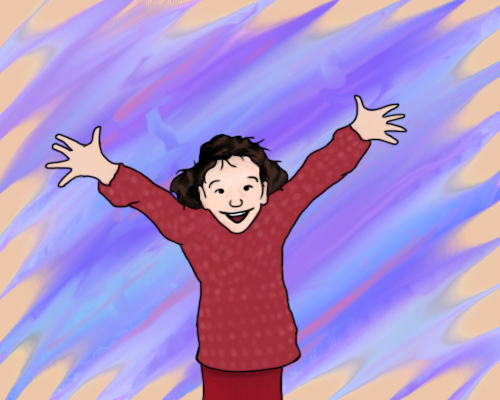 She’s a few years older than this now, but I found this picture in a Facebook album and right away I knew had to draw it. It looks so celebratory. This must of been the best day ever. The more time that passes from when I finished this picture, the more I’m finding little bits that are starting to bug me about how it turned out. However, I’m not letting that get to me, because I know that not only is this the first person that I’ve drawn (pretty much ever! ), but there’s also the fact that I’m pretty terrified about what people think of it. In the back of my head I know that drawing people can be offensive and it’s pretty scary to show it to people. Well, I have to start somewhere, eh? So, this is what I painted today using Photoshop and the mixer brush (and a regular brush for the outline), so I’m sharing it regardless! This entry was posted in Abstract, Character, Photoshop. Bookmark the permalink. Nice! Looks just like her, I knew it was her by just the thumbnail 🙂 yeah you got to start somewhere and this is a fantastic first try!